It’s more than you think. Of course ripping through the woods and over rocks on your mountain bike is great exercise and fun. 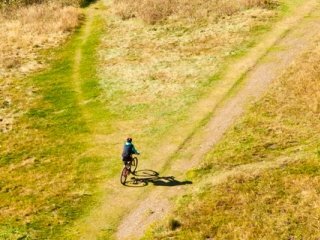 Who doesn’t love the rush of guiding your bike down a steep hill or beating an incline? You’re out in nature, up close, on an adventure. Often you have a group of friends or community of bikers and you meet other mountain bikers out there. There are many benefits from this sport, including some new ones. Have you thought about using your bike to explore your hunting grounds? Imagine driving to a gated off road and then biking the next ten miles instead of walking in. You’ll save time and have a great, early morning ride. If you’re thinking this is a challenge, yes it is! We have a great DVD from Born and Raised Outdoors called The Reason: Bulls Off The Beaten Path. These seven guys biked into the wilderness to their hunting spots and then walked in the final leg in. They bow hunted in the rugged Coastal forests of Oregon. That wins my vote right there. Going in on bikes makes less noise and allows you to get in further before walking. I’m sure it has its own challenges as well. Mountain biking is tough, and I can’t say I’ve done it with an elk or even turkey in tow. I’ve towed my two sons in a bike trailer and I’ve “gatored” my daughter to the back of my mountain bike. In theory, she was supposed to help me peddle but it turned out she freeloaded up the hills! Whatever you’re towing, it provides that extra challenge that you can feel great about later on. Mountain biking can add extra dimensions to other activities, whether it’s a family outing, hunting or fishing. It might make more planning and possibly more work, but are you looking for an easy way, or the next big adventure?